Over the years, Melody Carlson has worn many hats, from pre-school teacher to youth counselor to political activist to senior editor. But most of all, she loves to write! Currently she freelances from her home. In the past eight years, she has published over ninety books for children, teens, and adults--with sales totaling more than two million and many titles appearing on the ECPA Bestsellers List. Several of her books have been finalists for, and winners of, various writing awards. And her "Diary of a Teenage Girl" series has received great reviews and a large box of fan mail. She has two grown sons and lives in Central Oregon with her husband and chocolate lab retriever. They enjoy skiing, hiking, gardening, camping and biking in the beautiful Cascade Mountains. Is there room in one little hometown for four very different Lindas to reinvent their lives … together? Once upon a time in a little town on the Oregon coast lived four Lindas—all in the same first-grade classroom. So they decided to go by their middle names. And form a club. And be friends forever. But that was forty-seven years and four very different lives ago. Now a class reunion has brought them all together in their old hometown—at a crossroads in their lives. Janie is a high-powered lawyer with a load of grief. Abby is a lonely housewife in a beautiful oceanfront empty nest. Marley is trying to recapture the artistic free spirit she lost in an unhappy marriage. And the beautiful Caroline is scrambling to cope with her mother’s dementia and a Hollywood career that never really happened. Together, they’re about to explore the invigorating reality that even the most eventful life has second acts … and friendship doesn’t come with a statue of limitations. Once again it's kind of hard to read and review a book you haven't received yet... but I've enjoyed Melody Carlson books in the past and I'm sure this one would be no exception. Light reads that somehow still manage to have depth. 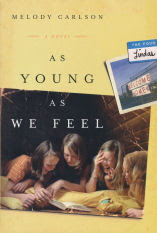 If you would like to read the first chapter of As Young As We Feel, go HERE.